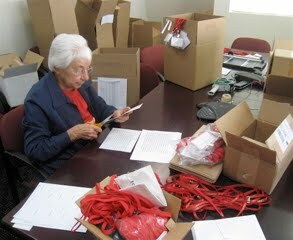 Meanwhile in the next room, our wonderful volunteer Evelyn is attaching the lists of events particular to each student onto the name badges. So - all of you out there packing your bags and leaving for San Francisco tomorrow - we can't wait to see you! !